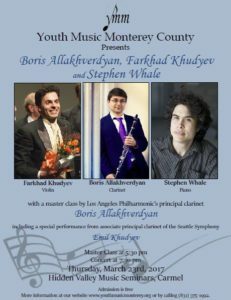 March 17, 2017 – On Thursday, March 23rd, Farkhad will perform an eclectic repertoire including his own music with Boris Allakhverdyan (Principal Clarinet of Los Angeles Philharmonic), Emil Khudyev (Associate Principal Clarinet of Seattle Symphony) and Stephen Whale (Australian pianist, Aaron Copland School of Music). The concert will start at 7:30 p.m. at Hidden Valley Music Seminars 104 West Carmel Valley Rd. in Carmel Valley, California.